UBC interior systems professionals are experts in several facets of a structure's interior. 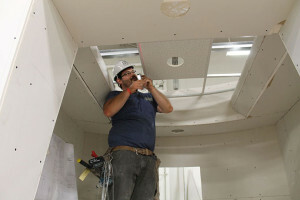 Typical work involves the installation of modern equipment and material in commercial and public buildings, including acoustical ceilings, computer-access flooring, metal framing, wall partitions, office furniture systems, and both custom or factory-produced materials. Their specialized skills are brought into play as they assemble complex interior systems using technical data supplied by manufacturers. Special care is taken and skills are acquired so that work in occupied facilities is done without interrupting the customer's tenants. We protect furnishings, adjust work schedules around office hours, and identify alternative staging areas so that the client's operations are not disrupted by our traffic. "Attention to detail is the hallmark of our professionals. Whether the job involves remodeling an existing building or fitting out a new structure." UBC interior systems professionals are trained to solve problems and complete tasks with the customer’s satisfaction in mind. Training is done in both classroom and hands-on settings at state-of-the-art training centers around the country. Initial training for apprentices and skill enhancement courses for journeymen are taught by industry veterans or industry and manufacturer technical experts. Subjects range from basic skills to new technologies, tools and/or installation methods. This comprehensive training translates into unmatched productivity by UBC members for their employers.